Titelseite der ersten Ausgabe des Journal des sçavans, herausgegeben 1665. ↑ Ioan James: Remarkable Physicists. From Galileo to Yukawa. Cambridge University Press, Cambridge u. a. 2004, ISBN 0-521-01706-8, S. xv. Harcourt Brown: History and the Learned Journal. In: Journal of the History of Ideas. Bd. 33, Nr. 3 = Festschrift for Philip P. Wiener, 1972, ISSN 0022-5037, S. 365–378. Henry Hallam: Introduction to the Literature of Europe in the Fifteenth, Sixteenth, and Seventeenth Centuries. Harper & Brothers, New York NY 1842. Ioan James: Remarkable Physicists. From Galileo to Yukawa. Cambridge University Press, Cambridge u. a. 2004, ISBN 0-521-01706-8. Frederick G. Kilgour: The Evolution of the Book. Oxford University Press, New York NY u. a. 1998, ISBN 0-19-511859-6. 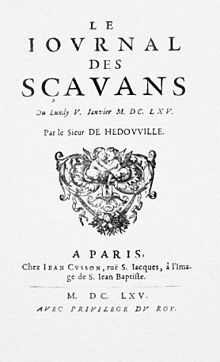 Betty Trebelle Morgan: Histoire du Journal des Sçavans depuis 1665 jusqu'en 1701. Presses Universitaires de France, Paris 1928 (zugleich Dissertation, Universität Paris 1928). Karen Hunger Parshall, Adrian C. Rice: Mathematics Unbound. The Evolution of an International Mathematical Research Community, 1800–1945 (= History of Mathematics. Bd. 23). American Mathematical Societyu. a., Providence RI 2002, ISBN 0-8218-2124-5. Diese Seite wurde zuletzt am 13. Mai 2017 um 19:51 Uhr bearbeitet.